NO purchase necessary. There are NO fees. This is not a loan. 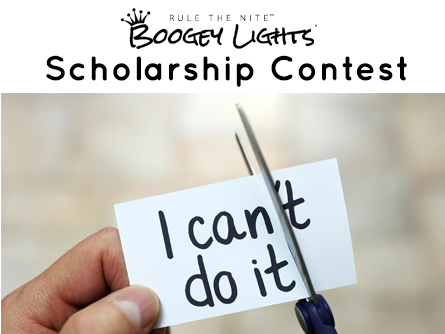 It is a FREE scholarship awarded by BOOGEY, INC. dba BOOGEY LIGHTS® hereinafter referred to as the Contest Sponsors. Scholarship contest is open to all fields of study for students who are at least 18 years of age and have been accepted to an accredited post secondary undergraduate program or college located in the United States for the school year specified on the contest page. The program can be a two or four year vocational, college or university. Financial need is not a consideration for this scholarship. Employees, affiliates and sub-contractors of Contest Sponsors are not eligible to participate. Although U. S. citizenship is not required, students must be lawful U. S. permanent residents or have applied for permanent residence (the application which has not been denied) and intends to become a U.S. citizen at the earliest opportunity allowed by law. Dependents of U.S. military or civilian personnel in overseas schools may participate. Contest essay may only be submitted using the online form provided by the Contest Sponsors. As such a requirement to participate in this essay contest is that all applicants have access to the internet and have a valid, working email account. Essays cannot be submitted any other way. Further, the winner of this contest will be notified by email. Contestant accepts all responsibility for maintaining a valid, working email account (including knowing how to check spam or bulk email folders). Scholarship award will be paid directly to the winner via Paypal™ or via Contest Sponsor company issued check - winner's choice. If you don't have a Paypal™ account, it only takes a few minutes to set one up and it's free. The scholarship winner will be notified via emaill. Award notifications returned as undeliverable or otherwise not effectively claimed (by executing and submitting an Affidavit of Eligibility, and Release) within 10 calendar days after delivery of notification will be forfeited and awarded to an alternate winner at Contest Sponsors sole discretion. Scholarship award is not transferable. No substitutions or exchanges will be permitted. All tax associated with the receipt or use of the scholarship award is the sole responsibility of the winner. Essays must be typed in English with no color or graphics and cannot be less than 750 words or greater than 2500 words in length. Essays under or over these word amounts will be eliminated. Every word is counted regardless of length. The essay title (theme) or added footnotes do not contribute to the word count. At any time during the contest additional participant personal information could be requested by the Contest Sponsors. In no way should contestants identify themselves within their essay (e.g. do not put your name on your essay.) Only one essay will be accepted per person based on the email address provided. The essay must be the contestant’s original work and a product of the contestant’s own thinking. The approach to the essay theme should be positive and clearly focused. Poetry is not acceptable. Quotations may be used sparingly if plainly identified wherever used. Contestants will be judged on the basis of their essay alone and are not required to present the essay orally. In all cases the Contest Sponsor shall have the final say as to who the winner is. Essay will be judged based on the knowledge of the theme, development of the theme and clarity of the ideas presented. Write your essay in an easy-to-understand format. Leave the reader with a clear understanding of your explanation and thought process of the theme. By applying for this scholarship and/or accepting any scholarship award in connection herewith, entrant agrees to indemnify and hold harmless the Contest Sponsors, their respective parents, subsidiaries, affiliates, and employees of all of the foregoing (collectively, "Releases") from and against any and all claims, actions, and liability for any injury, losses, liabilities, damages, costs and expenses (including without limitation, reasonable attorneys' fees), disputes, and/or disability resulting from participation in this contest and/or acceptance of any prize. Contest Sponsors are not responsible for lost, late, incomplete, stolen, misdirected, or illegible, entries or email; or for lost, interrupted or unavailable network, server, Internet Service Provider (ISP), website, or other connections, availability or accessibility or miscommunication or failed computer, satellite, telephone or cable transmissions, lines, or technical failure or jumbled, scrambled, delayed, or misdirected transmissions or computer hardware or software malfunctions, failures or difficulties, or other errors of any kind whether human, mechanical, electronic or network; or the incorrect or inaccurate capture of entry or other information or the failure to capture any such information. Releases are also not responsible for any incorrect or inaccurate information, whether caused by site users, tampering, hacking, or by any equipment or programming associated with or utilized in the contest. Releases are not responsible for injury or damage to entrants' or to any other person's computer related to or resulting from participating in this contest or downloading materials from or use of the web site. You represent that you have the right to use any and all content you submit as part of this scholarship contest, and no part of the content infringes upon the copyright or any other statutory or common-law intellectual property rights (including without limitation trademark, service mark, and trade name rights), proprietary rights (including without limitation trade secrets), or rights of privacy or publicity of any third party including the Contest Sponsors. You fully assign to the Contest Sponsors (to the extent such rights are vested in you) all copyrights and other intellectual property rights in any content transmitted by you at part of this contest. If for some reason the foregoing assignment is ineffective, you grant Contest Sponsors a non-exclusive, worldwide, perpetual fully paid-up license (with the right to sub-license) to use, reproduce, modify, adapt, publish, translate, create derivative works from, and to distribute, perform, transmit and display such content (in whole or part) and/or to incorporate it in other works in any form, media, or technology now known or later developed for the full term of any rights that may exist in such Content. In any event, without limiting the foregoing, Contest Sponsors may freely use the content without payment of any license fees to you or any third party, and may freely license this right to third parties. Contest Sponsors reserve the exclusive right, exercisable at any time, without notice, to amend, add to, delete from, alter or otherwise change these Terms and Conditions. If any provision (s) of these Terms and Conditions is held by a court of competent jurisdiction to be unenforceable under applicable law, then such provision (s) shall be construed, as nearly as possible, to reflect the intentions of the parties with the other provisions remaining in full force and effect. This scholarship contest and these official rules shall in all respects be governed by the laws of the State of Kentucky without reference to its principles of conflicts of laws. Scholarship contest is void in jurisdictions which prohibits this type of contest. Any contestant found to be in violation of these rules will be eliminated from the competition and will be required to return any prize money awarded or received. Questions about this scholarship contest can be sent to our CONTACT US page (select 'Other' as the reason).